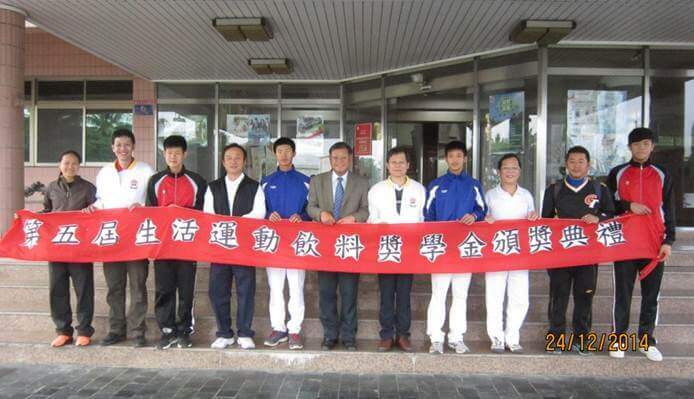 In 2012, Teamwells Cultural & Educational Foundation and Sunnano Biotech Inc., have jointly founded the “Nulife Sports Drinks Scholarship” with National Shan-Hua Senior High School under the spirit to encourage and motivate students to develop their full potentials in various circumstances which are ethical, intellectual, physical, social skills and aesthetic education. “The 5th Sports Drinks Scholarship Awarding Ceremony” was held at the Sunnano Biotech Inc., on Dec.24 th. There were 4 recipients, Lin, Wu, Tsai and Kung were awarded scholarship. “Thanks to the Nulife beverage for providing the opportunity, and I was happy to be awarded at this time.” Lin said. Teamwells Cultural & Educational Foundation and Sunnano Biotech Inc., dedicate to reciprocating society. With the Nulife Sports Drink Scholarship, the Foundation and Sunnano are looking forward to being a model in the entrepreneur field in developing a sports star in the future.